On Saturday 27th October the Harrison Lord Art Gallery in Brighouse is delighted to welcome the UK’s best-selling artist, Rozanne Bell, to open an exhibition of her latest paintings. Come and see these wonderfully uplifting paintings, always vibrant and witty, convivial and quirky. Her many fans are eagerly awaiting her first visit to West Yorkshire in 18 months and to see this exhibition which features over 50 new original works, all displaying her characteristically colourful and humorous style. Rozanne Bell has become one of the UK’s most loved artists because her witty, convivial and vibrant style is always uplifting in mood. Her celebrated depictions of wild-flowers, cosy sheep-farming villages, dreamy coastlines and quaint little fishing harbours are quintessentially British and yet unprecedented use of luminous colour and the trademark resin and metallic embellishments come from a very different influence – her native Zimbabwe. Focusing predominantly on the contemporary taste for naive art, Rozanne’s artistic techniques are displayed in each of her paintings, which encompass a complexity and variety of mixed media. The end result is a marvellous depth of colour and texture. Her steady search for new techniques and subject matter ensures that her skills are constantly evolving to produce a wide variety of art yet still being instantly recognisable as her own style. 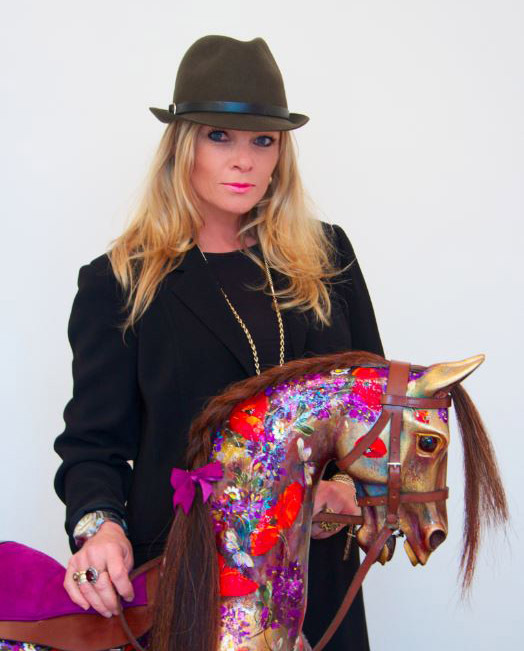 One of her greatest achievements was the charity auction of her remarkable Rocking Horse at Sotheby’s, Bond Street alongside works by celebrities including Dame Judi Dench, Maureen Lipman and Joanna Lumley, in aid of the charity CHIVA Africa which is working in Africa to stop the spread of HIV in children and teenagers.